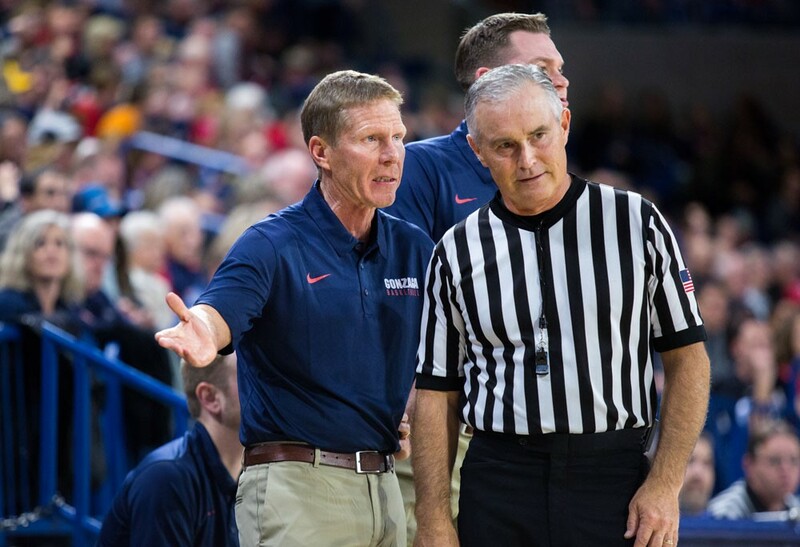 Gonzaga coach Mark Few saw his team put on a clinic Tuesday night in beating BYU in the WCC conference tournament. Tuesday was a great day for Gonzaga basketball. Both the men’s and women’s teams won championship games in the West Coast Conference Tournament at Orleans Arena in Las Vegas. As a result, both teams are now locked into the NCAA Tournament. This is the second consecutive season that the women’s team is heading to the Big Dance and the 20th straight for the men’s team. Gonzaga is ranked No. 6 in the nation and was the top seed in the WCC tournament. Brigham Young, which lost seven games in WCC play, was the three seed. The Cougars weren’t supposed to be in this game, and it showed. BYU’s presence in the title game came on the heels of a surprising upset of No. 20-ranked Saint Mary’s. For Gonzaga fans, getting to watch BYU dispatch their archrival in Monday’s semifinal was pretty satisfying. Watching what Gonzaga did to the Cougars on Tuesday was even more satisfying. Gonzaga won by 20 points, but led by as many as 32. The Zags largest lead of the game came with over 12 minutes to play. The Zags put together their best defensive performance in recent memory and absolutely dominated BYU. Gonzaga outscored BYU 36 to 2 over more than 10 minutes extending from the first half into the second. The great offense he mentioned came largely from Killian Tillie, who was named the tournament’s most outstanding player. Tillie scored 22 points to lead all scorers in the game. The sophomore from France averaged 24 points per game over Gonzaga’s three contests in Las Vegas. He was without a doubt the best player on the floor in each game, despite being left off the all-WCC first team announced last week. Which is absurd, considering there were 10 players and three Zags named first team all-WCC. Freshman Zach Norvell Jr., recently named WCC newcomer of the year, added 17 points in the win. Norvell scored in double-figures in all three games in Vegas. Jill Barta scored 32 points to help push top-seeded Gonzaga past a pesky sixth-seeded San Diego Toreros team in the WCC title game. The junior forward, who was named WCC player of the year earlier this month, took home tournament MVP honors. With a 17-1 record in conference play the Zags were the overwhelming favorites heading into the tournament in Las Vegas. That didn’t stop the underdog Toreros from putting up a good fight. It was a back-and-forth game for the first two quarters. Senior Sydney Williams, a Coeur d’Alene High School graduate, was the Toreros’ leading scorer in the first quarter and finished with 20 points in the game. Gonzaga eventually pulled away, to the delight of the overwhelmingly pro-Zag crowd of 6,661. The win punched the Zags’ ticket to the NCAA Tournament. Despite their 27-5 record the Zags would not have been a lock for the NCAA Tournament without winning the conference’s automatic bid.